Castaways is located near Colorado Springs. 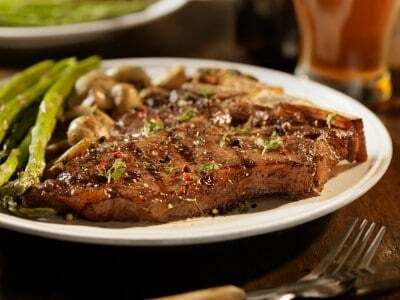 Castaways is known for excellent steaks and more! Make Castaways Steak and Mushrooms at home. Pound steak to flatten. Cut steak into 2 inch strips. Roll in flour, salt, and pepper. Add olive oil to hot frying pan; brown meat on both sides. Reduce heat to simmer; add herbs and 1/2 cup water and steam for 20 minutes. Add remaining water, wine, and mushrooms and cook 20 minutes more, or until tender. Check periodically, adding more water if needed. Remove meat from pan and add 1 to 2 tablespoons flour if necessary to thicken gravy. Serve with rice or noodles. Love mushrooms? Try these mushroom recipes. Bugaboo Creek Sautéed Mushrooms – garlic and mushrooms go together so well. I’m in love with this steak=) thank you so much for sharing this recipe!!! This turned out so good! I have never been to Castaways but next time I go to Colorado Springs I will try it and see if mine is as good as theirs! I will be cooking this again!